Posted Feb 02, 2018 by Eds. Writer Ursula Le Guin, who died on 22 January aged 88, overturned notions of what Science Fiction should be about. She taught us that what raises the possibility of liberation are the stories we tell, and that imagination is never something to be ashamed of but, rather, is our greatest asset. This is not just a comment on the importance of story-telling but a questioning of a consensus as to what a society values. Le Guin began writing Science Fiction during an era when the genre was still dominated by a lingering earlier generation’s approach to it. It was an approach to SF that is sometimes difficult to distinguish from a crude technological determinism. This was an SF of physics, chemistry and engineering. Its underlying premise was that developments in the hard sciences would shape the future, producing all sorts of technological changes while leaving many social relations just as they were at the time, gender roles untouched, and race relations as they are. It never questioned the premise that superior technology was always a marker of a superior culture. It was SF that suited a particular place and time, America in the boom years after World War Two. How could the most technologically and economically advanced country in the world not be the model for what all should aspire to? The future was an eternal unrolling of commodities, of better labour saving devices, faster cars, cheaper and more durable clothes and holiday resorts in orbit, while family relations stayed the same, inequality continued, racism was just natural. Some SF writers decided a while ago that true SF can only be based on the so-called hard sciences—astronomy, physics, chemistry, engineering, computer science, and so on. The word “hard” brings some gender luggage along with it. And sure enough, these guys find stories based on the “soft,” or social, sciences to be a debased and squashy form of the genre. Le Guin relentlessly pursued her own way in opposition to this sort of thinking. The result was some of the finest novels and short stories the genre has ever produced. The Left Hand of Darkness is a story about the visit of an envoy of a galactic civilization to a previously uncontacted planet. What is central is not the mechanics of space exploration but the particular biology of the inhabitants and the culture that has developed around this. The strength of the novel though is not its exploration of biology per se but rather what the encounter between the envoy Genly Ai and the inhabitants of Gethen tells us about ourselves, challenging our own assumptions about gender and sexuality. It is a beautiful novel set on a planet of eternal winter and once you have read it a part of you will walk through the frozen landscapes of Gethen forever. A very different contact story is “The Word for World is Forest”, which is an attack on colonialism written during the Vietnam War. This was originally published as part of the second of Harlan Ellison’s Dangerous Visions anthologies, which was a self-conscious attempt to promote a newer and more radical science fiction in the US. 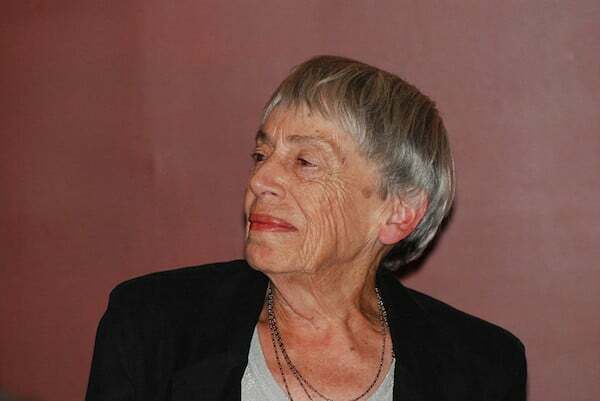 Le Guin had already shown her opposition to the war as one of the signatories of the 1968 anti-war statement in Galaxy magazine. In this work she depicts colonists from Earth as they enslave the natives of another planet and begin to exploit its resources. The themes are of rebellion and ecological devastation, war and militarism and they are powerfully made. So, when I realised that nobody had yet written an anarchist utopia, I finally began to see what my book might be. On two inhabited worlds orbiting the same star different political systems exist. On the resource rich planet of Urras there are two opposed states, mirroring something of the reality of the Cold War at the time of the book’s writing. The poorer planet of Anarres is one where the inhabitants practice anarchism. For myself, and many others, it was the first time where an alternative fairer and freer society was presented in a way that was utterly convincing. Unlike the long tradition of utopian fiction the novel draws on however it is not merely a description of a static situation but rather one were the possibility of conflict is not ignored but becomes the central drive of the story. And here is the heart of what I take from Le Guin. That it is the stories we tell that raise the possibility of liberation, that imagination is never something to be ashamed of but rather our greatest asset. Her reading of Tolkien inspired her not to imitate him but to realise the possibilities of fantasy in the Earthsea novels. Originally aimed at a young adult audience they have become beloved by many and central texts in the resurgence of epic fantasy since the 1960s. The Earthsea novels are unusual for this genre in that, as with many of her other books, most of the people in Earthsea are people of colour. Le Guin has suggested that this is why many of her books never had illustrations of people on the covers. Like many fantasy cycles Earthsea details a world that invites the reader to come and inhabit it. Yet it avoids easy wish fulfilment. The development of Ged as a wizard is one that involves an interrogation of the price of power and its temptations. Le Guin explores many temptations in her writing, such as the power that tempts Ged and the intellectual pride that beckons Shevek. There is even the particular temptations of those involved in revolutionary politics, in the story “The Day Before the Revolution” where the woman who will be remembered as the great revolutionary Odo in The Dispossessed worries about her younger comrades looking up to her too much. In one of her greatest stories ‘”The Ones Who Walk Away From Omelas” Le Guin dramatizes the everyday temptation to make your peace with the world you live in. In this story she poses a challenge to us all. If you haven’t read it go and do it, go and do it now. Then wonder if you would walk away too. This article is published in collaboration with Red Wedge.